October 4th is World Animal Day, a day to appreciate the wonderful animals we have on our planet. And a special day to give some extra attention to your pets and all animals in the world! No better way to celebrate than with an informative activity about animals! We have collected three activities for you that you can use in your classroom to celebrate World Animal Day. Our World Animal Day activity provides students with interesting facts about a variety of animals, along with some beautiful photos of each species. Use the World Animal Day activity to start a discussion with your students to talk about animals and World Animal Day in general. This activity presents twelve images of different animals; your students can tap on an image to view more information about that animal. After discussing each animal you can have a quiz with your students. For the higher grades, you can also use this activity to play a game. Let your students pick an animal from the list and give them the opportunity to give a short presentation about this animal. Later on, you can click on the info button in order to check which information was discussed, and what additional facts are available. Our ‘Animals’ game tests students in grades K-2 on their knowledge of some basic facts about animals. 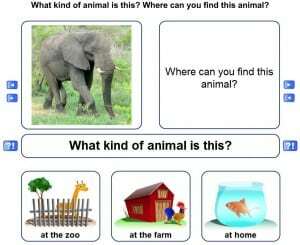 Students are presented with an image of an animal and asked to name the animal, as well as “Where can you find this animal?” with the images of three different locations below to choose from. You can then check the answers by tapping the “? !” button. 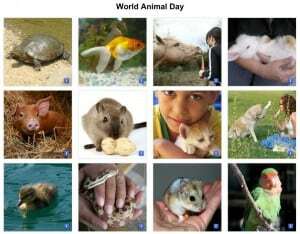 On World Animal Day you can also do math lessons in an Animal theme. Use images of animals to explain and practice counting, additions and subtractions. Gynzy’s image library offers you lots of great images and pictures of animals. Use the Counting to 10 , or pattern making lesson plan as an example and simply replace the current images with images of pets or wildlife. Have fun using these tools!